Stay healthy and continue having a blast running. Most days, I come out of a run feeling 10x better than I did going in. Boston 2009. I worked hard to achieve this 20+ year personal goal and was able to share the experience with a group of great friends/training partners. I’ve been running for 30 years, primarily focused on personal achievement. It is time to give back to the running community by helping others reach their personal goals. 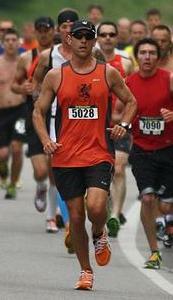 I co-paced in 2012 and we had a great group of runners joining our 3:25 pace group. I had an opportunity to get to know a number of them throughout the race and seeing them reach their goal was pretty cool. I’m consistent and will get you to your goal time with some time to spare. I have coaching experience at various levels and know how to encourage people to reach their potential without being over the top. Be disciplined with your training plan, encourage pace group “teammates” during the race, be patient and relaxed early on, and prepare to dig deep the final miles.